This article is a short summary of Fire Emblem: Radiant Dawn. 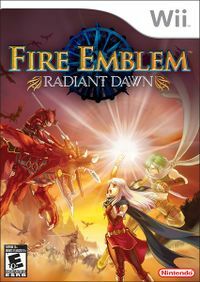 Fire Emblem: Radiant Dawn is the tenth title in the Fire Emblem franchise and a direct sequel to the previous title, Fire Emblem: Path of Radiance. The game was released for the Wii in 2007. Fight for a Better Tomorrow! Command the members of the Dawn Brigade, and use your strategy to free their homeland! Build an army that suits your tactics–strike from afar with Leonardo's bow, or attack directly with Edward's blade! Foster bonds between your allies to bolster their strength, but guide your soldiers wisely–if they fall in battle, they're lost forever! Three years have passed since the great war that ended in the death of Mad King Ashnard. His country of Daein suffers under the rule of the war's victors. Now, a small band of freedom fighters struggle to end the long, dark night of Daein's oppression. Micaiah, Sothe and a host of others – the infamous "Dawn Brigade" – rally under the banner of Daein's long-lost prince to bring a new day to this ravaged land. Command the Dawn Brigade and learn the story of their struggle. Then, gain a new perspective by joining Ike and the Greil Mercenaries as they watch Daein's battles spread throughout all of Tellius. Players can shape their armies to suit their strategy by choosing from dozens of unique characters. Should they use close-range attacks, like the brash Edward's sword, or attack from afar using Leonardo's bow or Ilyana's lightning magic? Players can build support relationships between their characters – as their relationships grow, so do their strengths as they fight together on the battlefield. Players should guide their armies wisely, because if a character falls on the battlefield, he or she is lost forever. The best-selling strategy title makes its Wii debut, with 16:9 widescreen support, newly added for the North American version, bringing a truly epic experience. Fire Emblem: Radiant Dawn is set three years after the events of Path of Radiance. This page was last edited on 18 September 2016, at 04:58.